At the end of September, Cultilene invited four French cucumber and tomato growers to visit two leading Polish greenhouse horticulture companies: the Mularski Group and VegaPOL. 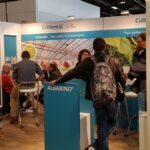 The French growers were updated on the developments in Polish greenhouse horticulture and shared their experiences, including those in the field of substrates. The French growers are a part of the Océane group. Seventy progressive greenhouse growers in the Nantes region, in the west of France, are affiliated with this cooperative. They grow 132 hectares of tomatoes and 32 hectares of cucumbers. The businesses also produce corn salad, radish, leeks and other crops. At the invitation of the Cultilene team in Poland, the growers and a growing consultant travelled to Poland for two days. With an area of approximately 1,200 hectares, Polish greenhouse horticulture is close to French in terms of area. The focus is on growing cucumbers and tomatoes. 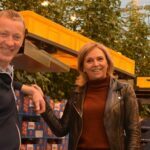 ‘The French growers, most of whom are already customers of Cultilene, were curious about the practical experiences with growing pink tomato varieties. About half of the tomato production in Poland comprises pink tomatoes. The sector of tomatoes is still growing, especially because a higher production can be achieved,’ says Agnès Robert, Account Manager for Cultilene in France. She accompanied the French growers during the visit. On the first day, a visit to the Mularski Group in Katowice was on the programme. The Mularski family business covers 46 hectares, spread over three locations, making it Poland’s largest horticultural company. The Mularski’s grow young plants and cucumbers, various kinds of tomatoes, and forest radishes. ‘In particular, the variety of crops in combination with the company’s own propagation was unique for French growers. You don’t come across such a broad corporate structure in France,’ says Agnès Robert. The French growers were also impressed by the high growing standards in the Polish company; they work with the most modern technologies. For example, Mularski’s cucumbers grow on the high wire and under assimilation lighting. This was followed by a visit to a VegaPOL grower growing pink tomatoes and cherry tomatoes. The grower was very open about his trials on plant density and rootstocks, with the aim of achieving a larger fruit size and a yield of more than 50 kilos per m2. 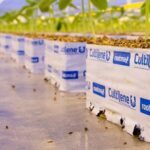 The seedlings used by the grower are grown in Cultilene’s Pc-cubes and supplied by Krason, the renowned Polish plant grower. Wojciech Junczyk, Cultilene’s Country Sales Manager in Poland, said the hot summer had left its mark in Poland. Many companies suffered some degree of losses. Some growers even had to stop their growing early. Will we meet you on the exhibition floor?